LeBow sophomore runs his own food service company. A German tourist at a craft beer festival in South Jersey gets in line at a food stand and asks, “What’s a fried Oreo?” He tries one. He loves it! He forgets about the beer and gets in line again to order more Oreos. Introducing international citizens to the delights of American concession fare is just one of the perks of being the CEO of Tony’s Tasty Treats, says LeBow sophomore Tony Grelli. Others include being a boss at age 20, and coming up with funds to pay your college tuition. Grelli, a finance and accounting major, is from Washington Township, N.J., where he was raised around the food business. His grandparents own a farm market with a deli and bakery called Duffield’s Farm. He spent his fall weekends at the farm among the thousands of visitors who came for the hayrides, pumpkin picking, corn maze and market. 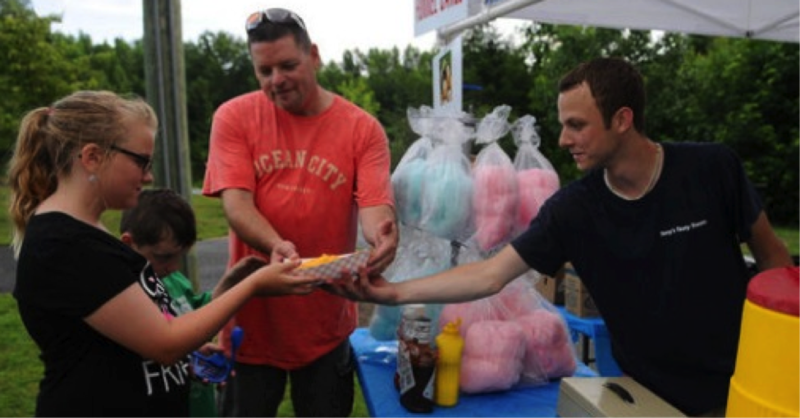 Last summer, Tony’s Tasty Treats was busy selling food at nearly 30 events. Thankfully, recruiting employees has been easy for young Grelli: He mainly employs friends and friends of friends. Another recent expansion to his business: Grelli now sells 10 different candy, caramel and gourmet apples and several “barks” — peppermint bark, white chocolate bark, caramel chocolate pretzel bark, just to name a few — at eight retail stores across South Jersey. These apples and barks can also be ordered online from Tony’s Tasty Treats’ Facebook page. After graduation he hopes to make a career for himself on Wall Street. “Hopefully by that time, Tony’s Tasty Treats will be able to run itself, and I can take a back-seat role as I focus on my job in the financial industry,” Grelli says. Tony’s Favorite Eats: His favorite tasty treat? Those fried Oreos. “I don’t eat many anymore, but who doesn’t like a fried cookie?” His two favorite restaurants in Philly are Baby Blues BBQ near 34th and Sansom and Ralph’s Italian Restaurant in the Italian Market. He’s also partial to Roast Pork Italianos from Tony Luke’s. Foodies across Philadelphia celebrated on April 3 as chef, restaurateur and Drexel LeBow EMBA student Kevin Sbraga got back into the kitchen. Hundreds of LeBow alumni, faculty, staff and students gathered last evening for festivities celebrating the Gerri C. LeBow Hall. Benefactor Bennett S. LeBow was in attendance as he addressed the large crowd during the evening and unveiled the portrait of himself and his late wife, Gerri, namesake of the 177,000-square-foot, 12-story building. Michael O’Halloran ‘02 brings his MBA to the kitchen at Bistro 7.